Republished: Penance! Penance! Penance! Pray to God for Sinners! Thus spoke the Mother of God herself to Bernadette Soubirous at the Grotto of Massabielle near Lourdes, France, on February 24, 1858, the eighth time that she had appeared there to Bernadette Soubirous, the first being on this very date one hundred fifty-six years ago. Having been in first grade at Saint Aloysius School in Great Neck, New York, fifty-eight years ago on the occasion of the centenary of this continuation of Our Lady’s apparitions in the Age of Mary that had begun with her apparition to Sister Catherine Laboure in the convent of the Daughters of Charity on Rue de Bac in Paris, France, in 1830, I can only express profound gratitude to have been brought back over the course time to the very same Mass of the ages that I was privileged to assist at fifty-eight years ago in the beautiful church that is Saint Aloysius Church. That Mass fifty-eight years ago was offered by the late Father Robert E. Mason, who had been ordained to the priesthood in 1956 and would later be the pastor of Our Lady of Lourdes Church in Massapequa Park, New York. My very life as a Catholic began in the Baptismal font at Our Lady of Lourdes Church in Queens Village, New York, on January 27, 1952, some two months, three days after my birth (I never understood why my parents let me be a pagan for so long), just fifteen days before the ninety-fourth anniversary of Our Lady’s first apparition to Saint Bernadette Soubirous (known in the religious life as Sister Marie-Bernard Soubirous). There has been, you see, a lifelong connection between this terrible sinner and Our Lady of Lourdes. The words spoken by Our Lady to Saint Bernadette Soubirous on February 24, 1858, are a summary of what we should be doing every day of our lives, especially during these days of preparation for the penitential season of Lent in which we are to prepare ourselves by prayer, penance, fasting, mortification and almsgiving for deep penetration into the mysteries of the Paschal Triduum of the Passion, Death and Resurrection of Our Blessed Lord and Saviour Jesus Christ. It is never “too extreme,” as some Catholic minimalists who are enticed by the spirit of this passing world contend, to do penance for our sins, to increase our fervor in prayer, to say as as many Rosaries each day as our states-in-life permit. None of us realize the horror of what our sins did to Our Blessed Lord and Saviour Jesus Christ in His Sacred Humanity during His Passion and Death and what they caused His Most Blessed Mother’s Sorrowful and Immaculate Heart. Although our sins are absolved when we make a good, full and integral Confession of our sins to a validly ordained priest and thus are assured that our sins exist no more, we do nevertheless owe a debt for each one of our sins even after they are absolved. Sin an offense against the Infinite God. We do not know how our sins have wounded Him once in time and have wounded His Mystical Body, Holy Mother Church, in time. We must, therefore, live penitentially at all times in addition to doing the particular penance assigned by a priest in the confessional as the condition for his absolution of our sins. We just do not know how much we owe. We must take upon ourselves voluntary penances, especially during Lent, in order to make reparation for our sins and those of the whole world. Take it from a sinner who is keenly aware of his many sins, which, sad to say, has diminished my credibility as a witness to the Catholic Faith on so many occasions in my life, we must never pass up any opportunity to embrace penance with love and joy. I pray each day to live long enough to do penance here on earth so that I can have some hope, if God willing and Our Lady interceding, I die in a state of Sanctifying Grace, of spending as little time in Purgatory as possible, recognizing that even one moment would be rather painful in comparison to anything I could ever suffer in this passing, mortal vale of tears. This is the Mother of God speaking. It is not to be a Jansenist to love penance and to live penitentially. Our Lady, the Mother of God herself, has told us that we must do penance, something she stressed in approved apparition after approved apparition, including her apparitions in the Cova da Iria near Fatima, Portugal, fifty-nine years after she appeared to the impoverished fourteen year-old Bernadette Soubirous as she was gathering wood near the River Gave not far from the Grotto of Massabielle. Shouldn’t that be good enough for us? Saint Bernadette Soubirous was told otherwise by the Mother of God herself. It was after repeated entreaties by Saint Bernadette Soubirous to reveal her identity, Our Lady said, “I am the Immaculate Conception,” on March 25, 1858, the sixteenth apparition and the Feast of the Annunciation (as well as the traditional date on which her Divine Son was Crucified on Good Friday). These words were uttered by the Mother of God three years, three months and seventeen days after Pope Pius IX had solemnly defined the doctrine of her Immaculate Conception in the Apostolic Constitution Ineffabilis Deus on December 8, 1854. Our Lady was ratifying that solemn proclamation of her own perpetual freedom from sin, begging us as well to try to live as sinlessly as possible in cooperation with the graces that have been won for us by the shedding of every single drop of her Divine Son’s Most Precious Blood and which flow through her own hands (as she had shown Sister Catherine Laboure in the convent at Rue de Bac twenty-eight years before) as the Mediatrix of All Graces. For you have not yet resisted unto blood, striving against sin: And you have forgotten the consolation, which speaketh to you, as unto children, saying: My son, neglect not the discipline of the Lord; neither be thou wearied whilst thou art rebuked by him. One might have expected to see Sister Marie-Bernard engaging in unusual austerities for she had a lasting memory of the call three times repeated by the Lady of the Apparitions: ‘Penance, penance, penance!’ Sensibly and submissively she complied with her confessor’s directions: in view of her feeble health there were to be no corporeal penances beyond those permitted by the rule: abstinence on the days prescribed, the constraints of obedience, the discomforts of common life, then the practices of daily self-denial: custody of the eyes, silence of the tongue, finally, resigned endurance of infirmities and sickness . . . . Those ‘mortifications that are not served up with the sauce of our own desire,’ as Saint Francis de Sales says so prettily, ‘are the best and most excellent, and also those that are met with in the streets–or in the gardens or cloisters–without our thinking about them or looking for them; and such as we meet with daily, however trifling’. Serious attention to all our duties necessarily involves the exercise of incessant mortification. . . . The mortification God asks of us is the exact observance of our Rule, of the practices, customs and instructions given by superiors. A Sister who is faithful in all this is practising a high degree of mortification and with no risk of vanity. In my opinion [here the preacher is speaking] she would be able to enter Heaven without passing through the flames of Purgatory. There are many daily mortifications which a recollected and attentive souls does not let slip: that of rising during winter at the fixed hour and with no delay, without turning over and over in bed, is most pleasing to God. . . . Again, if anyone comes in, don’t look or ask who it is. As for the sense of taste there is an infinity of mortifications one can do, without anyone noticing them. A nun should never make known her likes or dislikes for this or that food. . . .
She told me also that she did not promise to make me happy in this world, but in the next. Saint Bernadette Soubirous suffered much in life even before she entered the convent of the Sisters of Charity in Nevers, France. Even putting aside the doubts of her parents and the relentless questioning of her by the authorities of the City of Lourdes, France, Saint Bernadette was ridiculed by her school mates after the apparitions, ridicule she accepted as part of her penances. She suffered from asthma, which weakened her considerably. She was besieged by visitors who asked for her autograph (she signed, “Priez Pour Bernadette,” pray for Bernadette) and for her to tell the story of the apparitions for them. Saint Bernadette Soubirous was truly a victim soul, teaching us that we must be victim souls that unite ourselves to the Sacrifice of the Chief Priest and Victim of every Mass, Our Blessed Lord and Saviour Jesus Christ, as we give Him our offerings through the Immaculate Heart of the Queen of Martyrs who appeared to Saint Bernadette eighteen times between this day one hundred fifty years ago and July 16, 1858, the Feast of Our Lady of Mount Carmel. Who is any one of us, myself most especially included, to complain about anything that happens to us? Lucia: What do you want of me? Our Lady: I want a chapel built here in my honor. I want you to continue saying the Rosary every day. The war will end soon, and the soldiers will return to their homes. Lucia: Yes. Yes. Will you tell me your name? Our Lady: I am the Lady of the Rosary. The Lady of the Rosary was adorned with her Most Holy Rosary when she appeared to Saint Bernadette Soubirous, praying only the Our Father and the Glory Be prayers with the visionary (as Our Lady has no need to pray the Hail Mary herself; it is addressed to her and she is not a sinner in need of prayers from her at the hour of her death!). Our Lady wants us to give her public honor in shrines and to have public processions wherein her children by adoption, to whom she gave birth spiritually in such great pain at the foot of the Divine Son’s Most Holy Cross, pray the Rosary in reparation for their own sins and for those of the whole world, helping to save poor sinners from Hell in the process. Yes, Our Lady wanted public honor given to her in Guadalupe and in Lourdes and in Fatima. Public honor. Nations must not only recognize Christ the King, you see, they must recognize Our Lady as their Immaculate Queen. Every Christian land is a Marian land; there is not a nation redeemed in the blood of Christ which does not glory in proclaiming Mary its Mother and Patroness. This truth is brought into sharp relief by reflection on the history of France. Devotion to the Mother of God dates back to the early days of France’s evangelization, and Chartres, one of the most ancient Marian shrines, still attracts a great number of pilgrims, including thousands of young people. The Middle Ages, which, especially through Saint Bernard, sang Mary’s glory and celebrated her mysteries, witnessed a marvelous flowering of French cathedrals dedicated to our Lady: Le Puy, Rheims, Amiens, Paris, and so many others. . . With their spires upthrust they announce from afar the glory of the Immaculate; they heighten its splendor in the pure light of their stained-glass windows and in the harmonious beauty of their statues. They bear witness above all to the faith of a people which outdid itself in a magnificent display of energy, erecting against the sky of France the permanent homage of its devotion to Mary. In the cities and the countryside, on the hilltops and overlooking the sea, shrines consecrated to Mary — whether humble chapels or splendid basilicas — little by little enfolded the country in their protective shadow. Princes and shepherds of souls and the faithful without number have come to these shrines through the centuries, to the holy Virgin whom they have greeted with titles expressive of their hope or gratitude. Here they invoke Notre Dame de Misericorde [Our Lady of Mercy], de Toute Aide [of All Help], de Bon Secours [of Prompt Succor]. There the pilgrim seeks refuge near Notre Dame de la Garde [Our Lady of Watchfulness], de Pitie, or de Consolation. Elsewhere the pilgrim’s prayer rises to Notre Dame de Lumiere [Our Lady of Light], de Paix, de Joie, or d’Esperance [of Hope]. Or he implores the intercession of Notre Dame des Vertus, des Miracles, or des Victoires. It is a wonderful litany of invocations whose unceasing recital tells, from province to province, the blessings which the Mother of God has bestowed on the land of France through the ages. In many ways the nineteenth century was to become, after the turmoil of the Revolution, a century of Marian favors. To mention but a single instance, everyone is familiar today with the “miraculous medal.” This medal, with its image of “Mary conceived without sin,” was revealed to a humble daughter of Saint Vincent de Paul whom We had the joy of inscribing in the catalogue of Saints, and it has spread its spiritual and material wonders everywhere. Think about this for a moment: the Age of Mary, which began with Our Lady’s apparition to Saint Catherine Laboure to commence the wearing of and devotion to the Miraculous Medal, dawned upon us in France, the eldest daughter of the Church, the country where the Social Reign of Christ the King had been undermined by the corrupt rule of King Louis XIV and overthrown by sons and daughters of Judeo-Masonry in 1789 and 1792 (and in various revolutions thereafter). It was to France, the land of the modern social Revolution, that Our Blessed Lord and Saviour Jesus Christ sent His Most Blessed Mother to plead with the people whom He had redeemed on the wood of the Holy Cross by the shedding of every single drop of His Most Precious Blood to listen to her entreaties for their salvation, permitting her to give us the Miraculous Medal and the Green Scapular, which Our Lady herself said was to be given to Catholics and non-Catholics alike, to two different Sisters, Catherine Laboure and Justine Bisqueyburo, of the Daughters of Charity who lived simultaneously in the same convent at Rue de Bac in Paris, France. She appeared to Maximin Giraud and Melanie Calvat on September 19, 1846 near La Salette France, urging them to do penance for their own sins and those of the whole world, weeping over the infidelity of men (blaspheming, eating meat on Fridays and during Lent, missing Mass and working on Sundays), predicting also our own situation of apostasy and betrayal, a subject will be discussed in a subsquent article. These appearances, among others, including at Pontmain, France, on January 17, 1871, near the end of the Franco-Prussian War, were permitted in order to turn men’s hearts back to Christ the King who had been overthrown as men indulged themselves in their material and sensual pleasures and their naturalist fantasies about making a “better world” without Him and the true Church that He founded upon the Rock of Peter, the Pope. In addition to performing penances for our sins and those of the whole world as the consecrated slaves of Our Lady’s Sorrowful and Immaculate Heart, we must pray and work, my friends, to help others honor Our Lady, especially by means of praying with great fervor her Most Holy Rosary each and every day without fail. 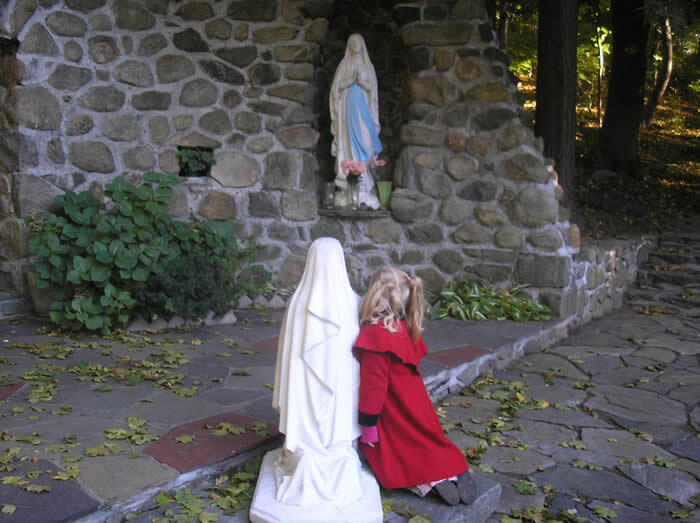 We must pray for the day when Catholics, especially those who have access to the media, will not be ashamed to speak of Our Lady and her Most Holy Rosary and of the compassion she has shown us at Lourdes and Fatima, of the tremendous gifts she has given us in the Miraculous Medal and the Green Scapular. Nations must not only recognize Christ the King. They must also recognize Our Lady as their Immaculate Queen. We must be instruments in helping to bring this about, planting a few seeds for the Triumph of the Immaculate Heart of our Mother and our Queen, of a new Christendom where every community has Marian shrines and every country organizes local and national processions in honor of its Queen. As we commemorate the one hundred fifty-eighth anniversary of the first of Our Lady’s apparitions in the Grotto of Massabielle near Lourdes, France, may we realize that to dishonor the Queen Mother is to dishonor the King, who is already so dishonored and despised by “modern” man and his various false “enlightenments.” We are called to do penance, now and always. We are called to live as citizens of Heaven as we fulfill our duties each day as citizens of a particular nation. We are called to invoke Our Lady’s maternal intercession and protection with every beat of our hearts, consecrated as they must be to her own Immaculate Heart and to the Most Sacred Heart of her Divine Son. We are called to live as the children Mary our Immaculate Queen in the service of Christ the King. On the way back to the Petits-Fosses [after the fourth apparition, February 19, 1858], Bernadette revealed how at a certain moment the Apparition seemed different from before. Suddenly loud yells, belched from the Gave, had rent the sacred silent of Massabielle. They ‘challenged, crossed, collided with one another, like the clamour of a brawling crowd’. One voice, more furious than the rest, dominated them all and roared out: ‘Get out of here! . . . Get out of here!’ Bernadette guessed rightly that the threatening curse was by no means addressed merely to her humble self, but was an attack directed beyond her to the Vision of Light standing above the eglantine. 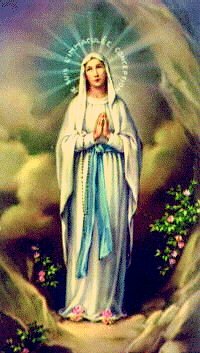 Our voluntary embracing of our own daily penances–and our absolute fidelity to Our Lady’s Most Holy Rosary as we keep ourselves and our children unspotted by the world–now and up to the hour of our deaths is the path by which which we can be greeted by the Lady of Lourdes and then crowned with a halo of sanctity for all eternity in the glory of the Beatific Vision of God the Father, God the Son and God the Holy Ghost. Saint Bernadette Soubirous, priez pour nous!